One of my favorite guilty pleasure foods is the eggplant Parmesan sub at my local pizzeria. It is made up of a crusty sub roll bursting with thin slices of deep fried eggplant, marinara sauce, and enough mozzarella cheese to cover a small pizza. It is absolutely delicious, in the way that anything deep fried and cheese-covered is delicious. Unfortunately (or maybe not), the guilt tends to outweigh the pleasure. For this reason, I am constantly on the lookout for eggplant parm sandwiches that are more kind to the conscience (and waistline). Well, I am happy to report, the search is over. Earlier this summer I made a version with roasted eggplant, fresh mozzarella, and homemade foccacia, and while it was good, it didn't make my heart go pitter-pat. Then came the September issue of Gourmet, a "Special All-Recipe Issue" with an alphabet theme. 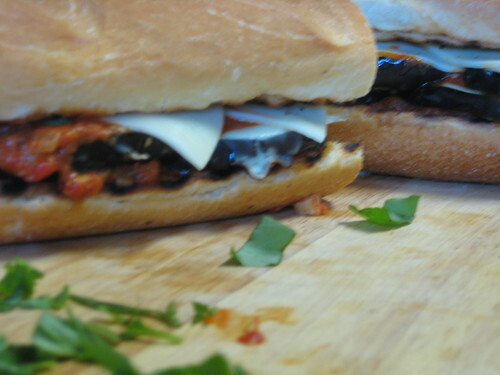 There, filling the E spot in the "Recipes A-Z" section, was a Grilled Eggplant Parmigiana Hero. It was love at first sight. So I made a shopping list and set out to make these subs for the Ravens' season opener (I freely admit that the only reason I "watch" football is to have an excuse to make football-watching food). And oh, I can not say enough good things about these sandwiches. They are better than the subs with the deep fried eggplant because you can actually taste the eggplant. The flavors are able to shine through without being subdued by all of the fat that comes from frying. Also, grilling the lightly oiled eggplant slices (even on my stove top grill pan) gives it a smokiness that made the flavor more interesting and complex. The roll is also grilled, so it has some of the smoky flavor along with a nice crust that stands up to the sauce and tender eggplant. The fresh tomato sauce, which takes advantage of the late-summer tomatoes, is what really elevates this sub into the realm of deliciousness. It is easy to make and has a bright tomato flavor. Caramelized onion contributes a bit of sweetness, and the addition of some freshly grated Parmesan cheese gives the sauce a salty richness. I also appreciate the fact that the recipe does not call for the basil to be stirred into the sauce; a liberal sprinkling of the coarsely chopped basil lends a freshness to the sandwich. If I didn't already love Gourmet magazine this recipe would have sealed the deal for me. It has only been a week, but I already want to make this again. 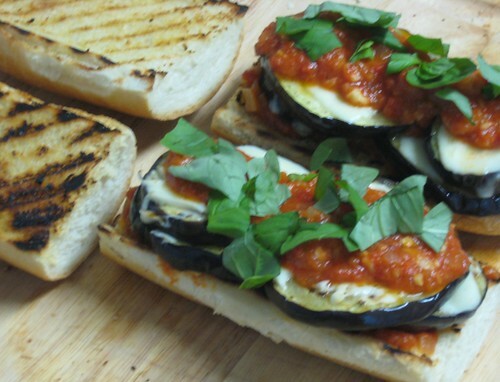 Now I know that the next time I get a hankering for an eggplant parm sub I am going to pass on the takeout menu (and the tummy ache) and head to the grocery store. Puree tomatoes in a blender until very smooth. Heat oil in a 3 to 4 quart heavy saucepan over medium-high heat until it shimmers. Saute onion and garlic with red pepper flakes until golden, about 4 minutes. Add tomato puree, 1/2 teaspoon salt, and 1/4 teaspoon pepper and simmer, uncovered, stirring occasionally, until thickened, 30 to 35 minutes. Remove from heat and stir in cheese. Brush cut sides of rolls with 1 tablespoon oil total. Cut eggplants crosswise into 1/2 inch thick slices. Brush both sides with remaining 3 tablespoons oil and season with 1/2 teaspoon salt. 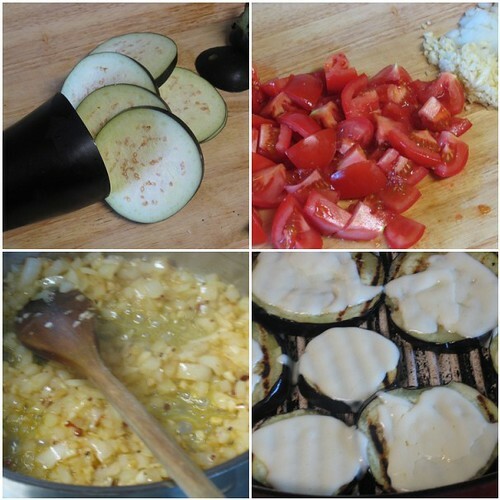 Oil grill rack, then grill eggplant (covered only if using a gas grill), loosening with a metal spatula and turning occasionally to avoid overbrowning, until very tender, 6 to 8 minutes. Top eggplant (still on grill) evenly with half of slices cheese, then grill, covered, until cheese begins to melt, about 30 seconds. Transfer eggplant with spatula to a large tray. Grill rolls (cut side only) until grill marks appear, about 1 minute, and transfer to tray. Transfer grilled rolls to 4 plates and spoon about 3 tablespoons tomato sauce onto each bottom piece. Top with eggplant, making 2 layers. Add remaining sauce, then top with basil and remaining cheese and close sandwiches. *If you, like me, do not have a grill, you can cook the eggplant in a grill pan over medium high heat. The approximate cooking times will remain the same. When it comes time to melt the cheese, tent the pan with a piece of foil. If you don't have a grill pan you could also saute the eggplant or roast it in a hot oven.